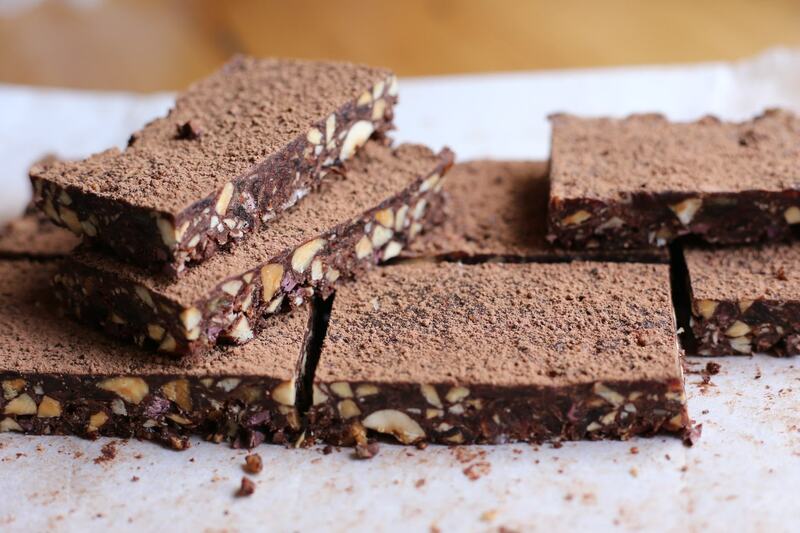 No baking, no flour, just raw chocolate goodness. Recipe loosely adapted from Oh She Glows. Feel free to loosely adapt this again to suit your mood or whatever you have in the pantry. Nuts, hemp seeds, any of your faves. Rich chocolate icing could also be involved, and would tip them over into an even bigger, sweeter treat. Makes about a dozen small slices. Use a food processor to whizz up the walnuts, then add the dates and process until it becomes a sticky paste. Alternatively, finely chop the nuts and dates with a knife like I did, and mix well in a large bowl. Add the cacao powder and salt and combine before mixing through the melted coconut oil. It should be a nice sticky mix, so add the second tablespoon of oil if it seems a bit dry. Fold in the cacao nibs for extra crunchy goodness, perhaps some more coarsely chopped nuts if your food processor ones became quite fine. Press the mixture firmly into a lined cake tin or tray. I used a 20 x 20 cm cake tin for these. Leave to chill in the fridge for an hour or two, (or in the freezer if you are in a hurry), and if there’s any left after the first sitting you can store them in the fridge. These look so delicious and healthy too! Can’t wait to make and share!